2017 is shaping up to be quite the year for the College of the Rockies Avalanche women’s volleyball team. 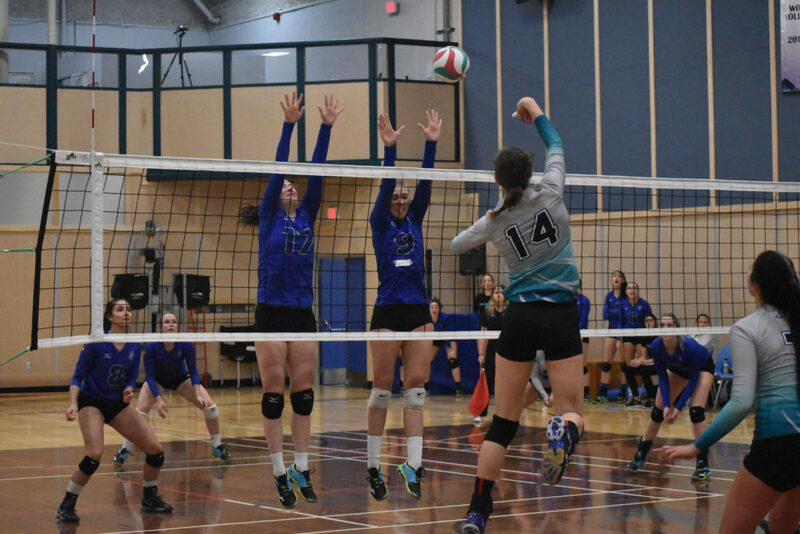 A week after beating the reigning top team in the country, the VIU Mariners, the Avs continued their strong play with a pair of 3-1 wins over the Camosun Chargers this weekend at the COTR gymnasium. The majority of the Avs’ first semester was spent on the road, where they earned a disappointing 4-8 record while playing eight of twelve matches away from COTR in October and November. This semester, their schedule is flipped, with eight home matches and only four on the road. Through two weekends at home this semester, the Avs are 3-1. Although the weekend ended exactly the way the team wanted it to, the Avs started out slowly on Friday night losing the opening set 25-22. Although they got down early, the Avs quickly perked up and made the necessary adjustments to get back on track. They closed out a second set nail-biter 25-23 before getting into a groove and ending the match with 25-17 and 25-19 wins. Leading COTR in the match was third-year middle blocker Taylor Forster, who put up a pair of digs, four kills, four blocks, and was named the team’s player of the match. Swanson said that the performance was Forster’s best of the year and also called out right side hitter Mikaela Pushor and left side hitter Alexa Koshman as difference makers in the win. Koshman led the team in both digs and kills on Friday night with 14 and 16, while Pushor added an impressive eight digs and 11 kills. On Saturday, the team once again struggled early but managed to pull out a gutsy 29-27 win in the first set, an effort Swanson said was a huge reason they managed to win. “I’m thrilled that we came back and found a way to win,” he said. “Losing the second set, instead of being down 2-0, now it’s 1-1, and we get the momentum going and we get the crowd going and we get our feet under us and we start to swing and play good defence and get our volume going. The Avs second set loss was another close one, falling 24-26, but was followed up by convincing 25-21 and 25-18 wins. One important adjustment was the handling of Camosun all-star outside hitter Michelle Zygmunt. Swanson was also pleased with the number of desperation plays and diving efforts the team put up, but thinks it’s an area that they still need to improve. “During one of the intermissions, I challenged one of the ladies [after] a ball landed in front of three players and nobody hit the floor,” he said. “We have some players who are fantastic hitting the floor all over the place. But, we need six people out there doing the same thing. In Saturday’s win, Swanson pointed to outside hitter Adriel Goodman as a big factor, just as she was against VIU last weekend. He also credited the team’s passing and in particular the efforts of libero Mackenzie Morey and setter Sarah Wood. “I think our passing [has] improved, which is a credit to [Morey],” he said. “I [also] think that Sarah Wood had the best match that she’s had since being here last year and she’s played very well. I thought she was extraordinary, just in her delivery of the ball. With the pair of wins, the Avs have moved up to fourth place in the PACWEST and are four points ahead of Camosun, although the fifth place Chargers have two matches in hand. The team’s next match is on Thursday, January 26 in New Westminster as the Avs play in their last road trip of the season with four straight matches in the Lower Mainland against Douglas College and Capilano University. The Avs return to the COTR gymnasium on Friday, February 3 to host the Columbia Bible College Bearcats, before ending the season with a visit from the University of Fraser Valley Cascades.